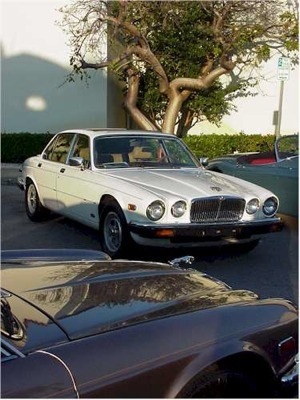 Excellent Buyer's Guide for Jaguar XJ Series 1, Series 2, Series 3, XJ40 (XJ6 & XJ12) type saloon (sedan) cars. There's so much to say about these wonderful cars that I am hard pressed to find a good beginning. Sporting, luxurious, handsome and very ruggedly built, the XJ Saloons set world standards for many years. Be aware, however, that purchasing a used example requires careful consideration. Although some technical discussion will follow, the principal idea behind this article is to discuss purchasing philosophy and strategy. Let's start, though, with a very brief description of the various models. The Series I production includes the 1968 through 1973 model years. It wasn't until about 1970 that production was really in full swing and presentable Series I cars are becoming somewhat scarce. All USA variants had the 4.2L engine but a 2.8L version was offered in other markets. Starting in 1972 the V12 engine was also offered and these models are highly coveted and rather rare. The Series I cars come with tons of olde-world charm, a short wheelbase, and that beautifully Jaguar-esque instrument panel with switches and meters spread far and wide. This was the car that had the saloon-car world on its ear for some time. The Series II production ran from model years 1974 to 1979 (or 1980, if you include the South African built models). These cars are loved by many and yet cast off as an unfortunate stepchild by others. The North American models bore the burden of none-too-attractive rubber bumpers (the chrome "Euro" bumpers, very attractive, can be fitted) and the "federalized" interior, by most eyes, lost much of it's classic appeal. Quality control problems, perhaps hyperbolized, and of less importance now than then, dogged the model. Notable Series II features include the longer wheelbase, modernized instrument panel and controls, and, for the '78-79 USA models, fuel injection. The V12 engine was once again offered but the 2.8L six-cylinder was dropped after a year or so. The creme de la creme of the Series II models was certainly the XJ6/12C Coupes. These handsome, vinyl-roofed two door models were manufactured for 1975-76-77 only and, despite some unique quirks, are very desirable and premium-grade examples are getting expensive. Most potential XJ buyers, though, are probably considering the Series III model. This handsome version was produced from 1979 to 1992. Don't confuse the later years ('86 to '92) of Series III production with the "XJ40" type saloons, and entirely different car. 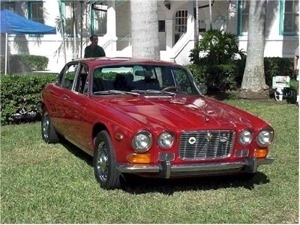 These later XJ6's ("XJ40" was the factory designation) were produced concurrently with the Series III beginning in 1986. The USA was introduced to the XJ40 car in the spring of 1987, as a 1988 model. All of the USA Series III cars (1980 through 1987) were 4.2 equipped. Rest-of-world models could have a 3.4L six cylinder or the much-desired V12, as well as a wide variety of trim levels and model designations. All North American models were sold "fully optioned". 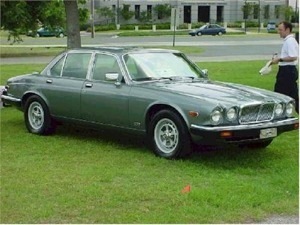 The US market saw only two models, the standard-issue XJ6 and the upscale VanDen Plas. The "VDP" was mechanically unchanged from the standard model but featured many interior refinements. The twelve-cylinder production carried on through the end of 1992, with many enhancements. The V12 Series III model was never brought into the USA officially but a stray cat or two has mysteriously found it's way past the federal gendarmes. Some sources say a small number of V12's came to the USA very early on, before Jaguar or the EPA pulled the plug. A mint condition Series III V12 will command a very high price, far higher than standard issue XJ's. The Series III cars are splendid and make wonderful daily-drivers. This model, other than the very earliest examples, was very reliable and was therefore responsible for a greatly improved image for Jaguar, with correspondingly high sales statistics. By many accounts it was the car which saved Jaguar. Okay, but what about buying one? Soon enough we'll discuss some "what to look for" particulars but, first, give some thought to your buying strategy. Are you looking for a Jaguar that you can immediately be proud of or a fixer-upper? What is your tolerance for expenditure and aggravation? Will you be working on the car yourself or be having all work done by a professional? These are vitally important questions. These cars, considering their provenance, and with the previously mentioned exceptions, are surprisingly inexpensive and in some cases, downright cheap. Don't be fooled, though. Unless you are actually looking for a project car it is much more practical to buy a premium example. Although inexpensive to buy, an XJ can be every bit as costly as other Jaguar models to resurrect, and it would be very easy to find yourself hopelessly "upside down". Consider this. Much of the Jaguar appeal comes from the gorgeous paintwork and "gentleman's club" interiors. A premium re-spray may well top $3000, and new leather, wood, headliner and carpets will certainly be $4000 or more. Assuming you want a Jag to be proud of, it would be very easy to spend $7000 on cosmetics alone yet the difference in buying a lovely example versus a "tatty" specimen may be only half that amount. Of course, many Jag-lovers are already familiar with such scenarios and remain unfazed at the thought, and I certainly do not disparage them. However, since the market on these cars is so low, and increasing only very slowly, extreme caution is required. A well-versed XJ buyer may find that one of the best buys, in fact, can be the slightly tatty car which has had the major work already done, it's discouraged owner simply "wanting out", wishing he had originally bought at the higher end of the market and avoided the expense and frustration. Resurrecting a Jaguar, any Jaguar, is not for the faint-of-heart. The Series III was built in large numbers and the survival rate has been good. I urge that any prospective buyer spend plenty of time shopping and wait for the "right" car. I assure you, they are out there. Series I and II cars, however, are a different story. The normal rate of attrition has, of course, reduced the supply. Remember, too, that the resale value on Jaguars was notoriously low, leaving many cars unloved and neglected at a relatively early age. 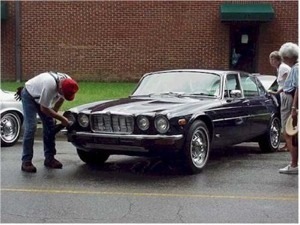 Subsequent owners of the inexpensive Jaguars often didn't have the resources or, considering the value, the desire, to look after them properly. Some restored, or at least well-freshened, Series I cars are out there, thanks to the obvious character and appeal of that model. Personally, I hope more of these cars are saved but, with values still low, it would clearly have to be an emotional decision to bring one back from the ashes. Of course the same could be said for just about any Jaguar model but, again, the narrow margin on these cars is tricky business. Some of the best bargains may be the Series II cars. Although the Series II's enjoy a certain loyal following, these cars are generally (and needlessly) unloved. On one hand this means that finding a well-kept example may be difficult yet, on the other, some good buys may be lurking. The previously mentioned caveats apply, though. 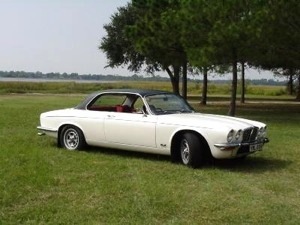 While discussing the Series II's, it should be mentioned that the Coupes really fall into their own niche. This model is very desirable and is appreciating more rapidly than the sedan versions. I won't go as far as saying any Coupe is worth buying but a less conservative approach may be justified, providing, of course, you don't let your emotions run totally unchecked. One of the advantages of the XJ saloons, despite urban legend, is their relative simplicity. A great many repair and routine servicing operations are well within the realm of the average do-it-yourselfer. In fact, this is one of those cars where, contrary to convention, a prospective buyer may do well to consider cosmetics over mechanicals. As mentioned previously, body, paint and interior refurbishment can be very costly but many mechanical repairs are surprisingly inexpensive for a home mechanic. Of course, a major engine or drivetrain failure would not fall into this category but, after some homework, an XJ buyer can readily identify which faults appear expensive but, in fact, are very easy to fix. Any discussion of used Jaguars must eventually turn to the subject of rust. These cars are as rust prone as any other Jaguar and, unless you are actually looking for a restoration project, I would avoid a rusted car. Remember, these are not a particularly rare automobiles. Rust free examples can be found. Once you start shopping you find plenty of examples to choose from. Naturally, if you are specifically looking for an older model, you may have to broaden your search grid to find a rust free car and, of course, your own geographic location has a very strong bearing on your results. Look for rust in all the usual places such as floors, sills, and lower doors. Also check around the headlamp openings and, oddly, the floorpan area where the rear suspension trailing arms attach. Now comes the exception which proves the rule. A great many XJ's, especially the Series III examples, are known for developing rust at the base or lower corners of the front windscreen. As rust repairs go, rectifying this problem is not too difficult or costly. Some extreme cases, though, have perforated clear through and let water leak inside the car. This, obviously, is not a good thing. However, my point here is that if the car is excellent in all other respects do not let some minor rusting in this area eliminate the car as a candidate. The six-cylinder XK engine, as we all know, is a paragon of ruggedness. With good care, 100,000 miles is a doddle for these engines and 150,000 miles is not unheard of. Head gaskets are considered a routine replacement item at 100,000 miles and, in the Series III cars, the tappet guides were known to work themselves free from the head and contact the camshaft, with catastrophic results. A "hold-down" kit can prevent this mishap. The V12 engines were also very robust but, generally speaking, simply do not tolerate overheating at all. It is doubly critical, therefore, that the cooling system on a V12 car be kept absolutely up-to-snuff and be wary of an example which does not show evidence of proper upkeep. Engine repairs on the V12's are notoriously expensive. The transmissions, Borg-Warner designs on the six cylinder cars and earlier V12's, and the GM TH400 on later V12's, present no serious problems. The Borg-Warner types were not very sophisticated but seemed to work well enough. Some overhaul parts for these are becoming a bit scarce. The TH400 transmission is world renowned for it's reliability and smooth operation. Remember, though, that many of these cars are becoming rather elderly and, even if well kept, the transmissions may be at the end of their normal expected life. Manual transmissions were offered in 6-cylinder variants for some markets but only a very small percentage of the cars were so equipped. There are a couple mechanical areas to be mindful of, though. First, the rear brakes and differential seals. Some explanation is due here. Replacing the rear brake pads is simplicity itself but replacing the rear rotors, or the differential seals behind them, is very labor intensive. Likewise for repairs to the parking brake calipers. These repairs must eventually be carried out on all models but, obviously, it is a real "plus" if service records show that such repairs have recently been done by the present owner. Ideally, the owner will have had calipers, rotors, seals, bearings, etc. all replaced at the same time, a real bonus for you. I might add, at this point, that the differentials are nearly indestructible. The rare failure usually occurs when the owner postponed the above-mentioned seal replacement and allowed the unit to run dry of fluid. The other difficult area is the climate control systems. Repairs such as a heater core or evaporator core replacement are very difficult and labor intensive. The Climate Control systems on the Series II and III cars are quite tricky with some rather expensive servos and amplifiers. The best advice for the uninitiated would be to make sure that all heating and air conditioning modes function correctly or consider avoiding the car. Don't ever believe a claim of "it just needs a recharge" when questioning an inoperative air conditioner. If that was the entire problem the owner certainly would have had it recharged himself. While a handful of climate control problems are easy to fix, it is hard to tell from a simple inspection and if a total system overhaul is ultimately needed the bill could easily top $2000. Returning back to the positive, I'll reiterate that many repairs (steering, suspension, cooling system, etc) are no more difficult or costly than on an "ordinary" automobile and most mechanical parts are readily available and, in many cases, surprisingly inexpensive. Notice I referred to mechanical parts here. Trim and body parts can be very costly and in some cases (such as Series I items) becoming scarce. A complete and documented service history is another real advantage. Let's face it, a well- kept Jaguar is a purring kitten but an ill-kept Jaguar is an unforgiving wretch. Naturally, you'd prefer the pampered example and service records will prove an owner's claims. Additionally, service documentation will tell you if some of the above mentioned major repairs have already been tackled. The owner's loss may well be your gain. If you are not mechanically minded it is imperative that you have the car examined by a mechanic. Not just any mechanic, a bona-fide Jaguar mechanic. He will know exactly what to look for and can give you a report on the severity of sub-par items. Here again some minor flaws may work to your advantage. The owner may be disgusted with the car yet the faulty items may well fall into the very-easy-to-fix category. A true Jag-man will know! Lastly, please remember that we are talking about cars that are anywhere from 9 to 33 years old. Even if you find a wonderful example, it would be unrealistic to buy any used car with an expectation that nothing will have to be repaired or serviced. Comments on "XJ Saloon Buyer's Guide"